Ant man themed hide and seek with powerups and many hiding locations. The map includes a resource pack with custom ant man characters and other models. There's also custom rooms that can be unlocked using keys. Make sure to add this map link to your video description if you are recording this. [Seeker] Shulker shell: Big levitation boost, easy way to get to the top floors. [Hider] Firework: Removes some time from timer but using this can be risky. 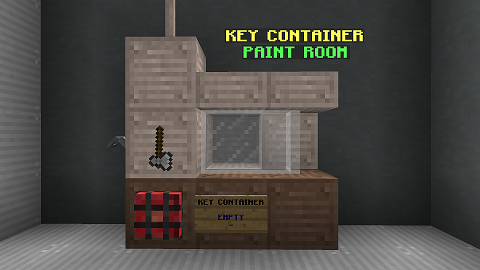 There are 3 places where keys can spawn: Paint room, Laboratory and Kitchen. Every round the key spawns randomly at one of those locations. Once the Hider claims the key. thay can use it to open up the Server room. There are 2 locations where server room can be opened from.